When I graduated from Culinary School I wanted to open a tart shop and serve savory and sweet tarts as well as soups, salads and baked goods. Unfortunately, I never opened my tart shop, but instead went to work for a restaurant and worked my way up the ranks. Several months after I was hired and during the busiest month of the year (December), the pastry chef quit and I took over her position until they could find a replacement. By the way, they didn't find a replacement until the following April--but that was fine by me because it was a great learning experience. My favorite part about the pastry position was making tarts, both sweet and savory...and I made a lot of them during that time! 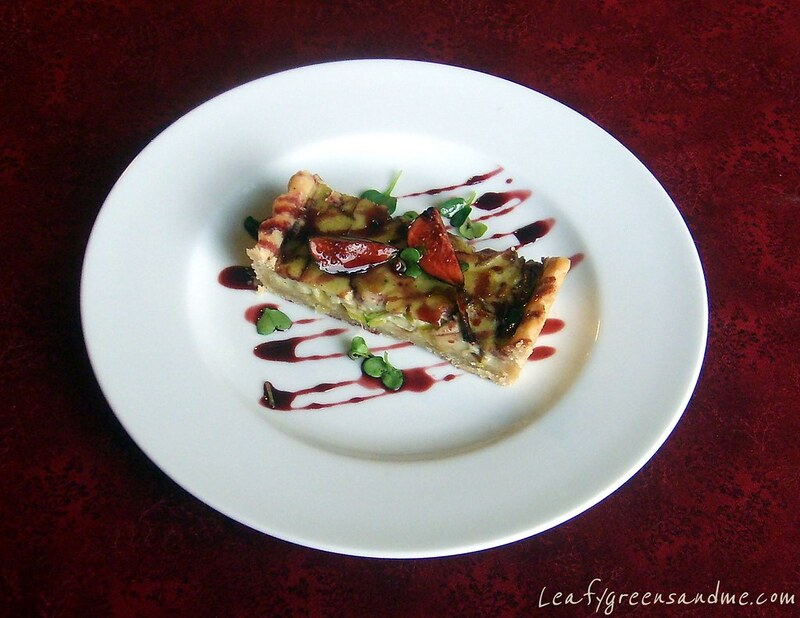 One of the tarts we served that was a favorite by customers was a herbed-goat cheese and leek tart. It was on the menu for the entire five years I was there. We tried taking it off but customers always requested it and so it stayed. Since switching to a vegan diet, I've always wanted to recreate this tart, without the goat cheese of course, and so I substituted a creamy cauliflower puree and it's just as delicious or even better than I remember. It's also a beautiful tart and will make a great presentation at your Thanksgiving dinner or anytime you entertain. Drain cashews and place in a blender, add water and blend until smooth for about 4 minutes. If you don't have a high-speed blender, like a Vita-Mix, strain the cream and set aside. You'll need 1 1/2 cups cashew cream for the recipe. Remove dough from bowl and place on a cutting board and form into a 1" high flat disk/circle or rectangle, depending on the shape of your tart pan. Remove dough and place on a lightly floured cutting board and roll out to about 3/8" thick in either a rectangle or circle depending on your tart pan. Place dough in tart pan pressing along the bottom and edges and remove excess dough from the edge. Prick dough about six times with a fork and place tart in the freezer for about 30 minutes. Remove tart from freezer and line with foil or parchment paper and fill with baking beans. 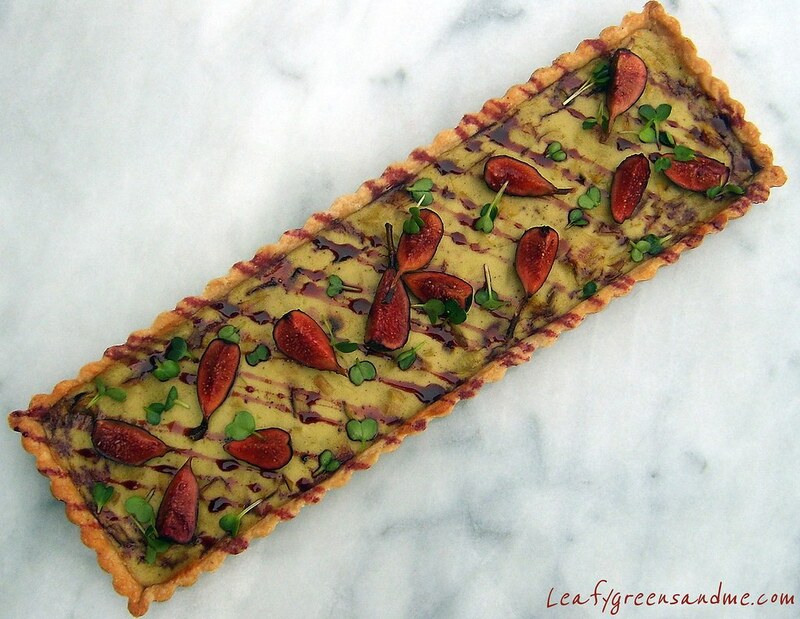 Place tart pan on a sheet pan and bake in the oven for 20 minutes, rotating half way through the cooking process. Remove foil/parchment and baking beans and bake 5-7 minutes longer. Saute leeks in olive oil for about 5-7 minutes until tender. Cook on a low enough temperature to keep the leeks light in color--you don't want to brown. Place in a medium sized bowl and set aside to cool. Heat a saute pan on medium-low, add olive oil and onion and cook for a couple of minutes for onion to soften. Add cauliflower, vegetable stock, garlic, thyme and salt and pepper. Increase heat to medium and cook for about 20 minutes until all liquid is absorbed. Using a spatula, scrape cauliflower mixture into a blender and add cashew cream and cornstarch. Blend on high until smooth and creamy and season with salt and pepper if needed. Add 2 cups of blended cauliflower puree to the sauteed leeks and stir to combine. Turn down oven temperature to 350 degrees. Spoon cauliflower-leek mixture into prepared tart shell and place on a baking sheet. Bake in the oven for about 20-25 minutes, rotating half way through the cooking process, until firm to touch and tart shell is lightly golden brown. If tart shell starts to get too brown, cover edges lightly with foil. Remove tart from oven and let cool for about 15 minutes on a rack before removing tart ring. Just before serving, drizzle with port glaze and garnish with sliced figs and micro arugula or micro greens. Add ingredients to a small sauce pan and reduce on medium heat until it turns into a syrup and coats the back of a spoon, about 20 minutes. Mixture will thicken as it cools. You want it to be thicker than maple syrup, but not as thick as molasses. Slice figs and toss lightly in syrup and then garnish tart. Drizzle with extra syrup. i recently found your blog and i am in awe. your recipes and photos are gorgeous! (this tart specifically got my attention.) i look forward to being a dedicated reader of yours and can't wait to follow along with your amazing food creations! just found you too.. the tart looks fabulous and so prettyy! i love the idea of cauliflower puree and the nice port glaze. YUM!! I'm really excited to try this. I was wondering what size tart pan you used. All I have are the small circular (4 1/2") tart pans so I want to make sure I do the right number of equivalent ones to your large one. I think that the recipe would make 6 servings using a 4 1/2" tart pan. Let me know how you like it! Thanks!